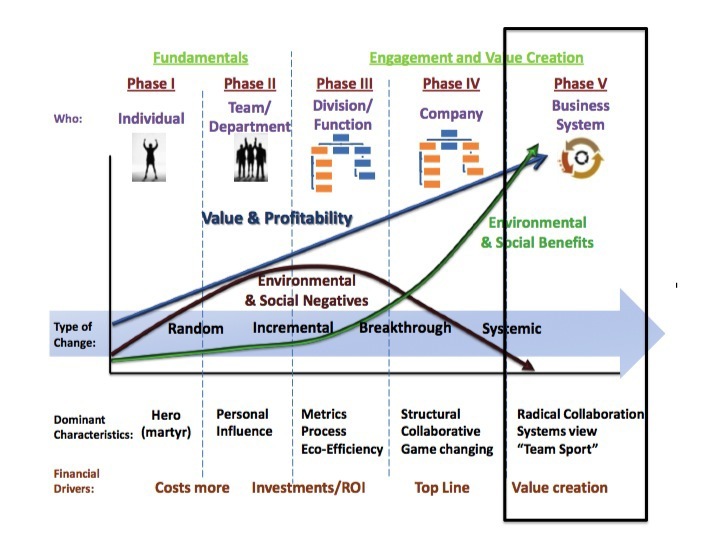 The roadmap series details the Hagen-Wilhelm change matrix, a tool to accelerate adoption and maximize the benefits of sustainable business thinking. This model builds on the work of many thinkers, leaders and researchers who have identified five stages that companies pass through on the way from today’s conventional thinking (Phase I) to a more sustainable future where business thrives by solving some of the worlds biggest problems. Earlier posts tried to help organizations get started by making that critical first step: Phase II. And then offered tips and insight into moving on to Phase III and Phase IV. Each phase represents a big shift for the company, perhaps none more than Phase V. If earlier phases focused on how we do things, Phase V asks us to rethink what we do. In the final state, success will mean solving customer problems in ways that are inherently advantaged because we create environmental and social value in the process. In this stage new solutions will quickly be adopted because they are inherently more profitable and because old solutions will loose their social license to operate. This is because conventional competitors who’s business causes harm will be seen as irresponsible, and perhaps even as exploitive while new solutions will enjoy wide stakeholder support. That’s a lot of change in a short paragraph and there are not many examples to prove it yet. One that illustrates the point is happening in Seattle. An organic fertilizer company has solved a big part of the city’s solid waste problem by composting garbage into organic topsoil instead disposing of it in a landfill. While conventional waste haulers where competing on lower trucking or disposal cost, this company saw the “waste” as their raw material and turned the business upside down. Now they don’t pay for their raw material, they get paid to take it; they literally get paid coming and going. How could a conventional one-direction waste hauler compete? The incumbent lost 40% of their business nearly overnight. The fertilizer company outcompetes them on cost and once it was demonstrated that the waste could be turned into soil, it would look irresponsible to landfill it in the future – the original solution has lost it’s social license to operate. This new business model has an enduring competitive advantage because it creates environmental and social benefits while it solves the customer’s problem and is fundamentally more profitable in the process. Phase V sustainable business will be a huge change in the way we do things. This shift should be seen in business strategy sense as the equivalent of a disruptive technology, as significant as the emergence of the Internet. It will change everything in some way and there will be winners and losers. Companies that fail to adapt will be at risk of being displaced and the disruption will mean that competitive alternatives will emerge from unforeseen directions. For example the waste hauler probably never saw the fertilizer company as a competitive threat. This means that incumbent companies will either see new ways of doing things and lead or will end up holding on to old ways and looking like obstacles, destroying their brand and their business. There are many examples of companies who lost in disruptive shifts; Kodak lost to digital photography, Blockbuster lost to on-line streaming; however, sustainable business solutions will have an extra force accelerating the transition. The new solution will not only have lower costs, it will have positive PR momentum and popular support. Can you imagine the landfill company convincing Seattleites that paying to burying their waste is acceptable now that they know they can/should make it into fertilizer or soil? Even if landfilling were free, it would not be acceptable (and composting would still have a financial advantage). Just to make a point about so-called “green tech”; Phase V is not only about a better mousetrap – it’s doing business differently. There are plenty of “greener” technical solutions that are not being implemented in ways consistent with sustainable business thinking. That's why I'm not suggesting that the Seattle company is at Stage V, in fact no company has ahieved it yet. Indeed, the cases of unintended consequences and unfortunate substitutions are many and usually stem from an insufficient systems view of the business. It’s only really Phase V if the company and its eco-system are operating according to sustainable business thinking in both what they do and how they do it. As a result Phase V is not simply a bet on technology or “business as usual” to fix environmental and social problems. Phase V is the culmination of doing business differently by adopting the skills, competencies and strategy of sustainability. We can’t be sure what the future will look like with such a powerful disruptive force in play. In fact it’s not guaranteed that entrenched solutions can be replaced, incumbants will not go down without a fight. Some companies will choose to use all their power to resist instead of change – witness the actions of the coal industry today. Other thought leaders and authors have offered views and insights that give different twists and possible takes on this future state. A recent example is this article in Fast Company by John Fullerton and Hunter Lovins - Creating A “Regenerative Economy”. What is sure is that the disruptive force of sustainable business is on the move and companies; either incumbents or upstarts who adopt this approach will have an advantage. How can companies capture this competitive advantage? This notion of sustainability being a disruptive force that will require environmentally and socially positive solutions to customer problems is a pretty big step. Companies that are moving up the change matrix have a big edge because they are learning the new organizational skills and competencies that will be the key. One of the most important is radical collaboration – the ability to work with a network of partners beyond classic vendor/customer relationships, because sustainability is a team sport. In fact, Phase V cannot be achieved alone. The whole point of sustainability is that it describes a well functioning system. So we will need the ability to participate in coalitions or clusters of business, NGOs, Government, and Academia all working together to deliver new, restorative outcomes. For example, in order to make composting work in Seattle many things had to change. The city government had to implement new thinking, customers had to change the way they do things, in short it was a system shift. The Change Matrix is a powerful tool to help companies and change agents see a few steps ahead. It helps plan the shift and helps get the most out of each step along the way. Everyone in the company has an opportunity to be a part of the change. We have a chance to make the future a place where people and the planet thrive while our enterprises represent the best in us. A place where the more successful our business the more benefits we create and the more benefits we create, the more successful our business. This is the hope of sustainable business strategy – thank you for being a part of it.